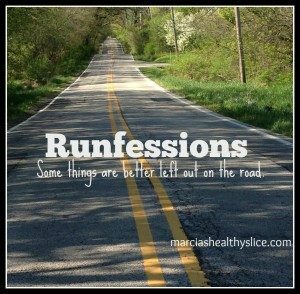 What makes someone officially a runner? Ask ten people, get ten answers: Running a certain distance/pace; (not) running on the treadmill in bad weather, etc. My answer? Falling. So yes, after 18+ months running, I am a runner. 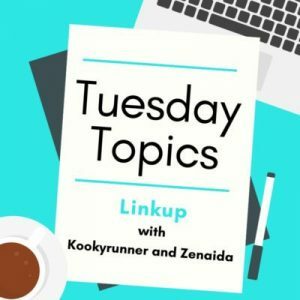 I might even say I’m a blogger with three posts this week! Just minding my business, when the trail jumped up and bit me! Sunday: was supposed to be a rest day, but after a quick cameo at Bastille Day where it was too humid/crowded (I can barely cope with my own sweat; I don’t want anyone else’s touching me!) to stay long, I was antsy. I also knew that Tuesday’s schedule meant I wouldn’t even get to the gym so I should really move my rest day there. I knew I shouldn’t run, but walking to nowhere on the treadmill drives me bonkers so I decided to row. Although the time wasn’t wow, it was a good workout. When I’m at the good (read: cool) gym the stretch area and TVs are right in front of the rowers. The TV isn’t a major distraction but people doing all sorts of strength training is. Some of their workouts are intimidating, but some make me curious. I think I still have a free training session from joining that I really should explore. I had enough steps from Bastille Day and erranding that a Target run (to the only one that doesn’t sell k-cups!) got me over goal and then I stopped at LaMia and actually ate in. I really wanted to finish my book and there are just too many distractions at home, so win win. Monday: I may or may not have tried to drink my weight in water. I generally don’t worry too much about water because I drink pretty regularly throughout the day. It’s especially easy at work because we have an amazing Blupura machine from which I can get an infinite supply of sparkling water. That machine, and the office providing free seltzer is what finally got me to kick the soda habit almost completely (you can pry my diet root beer from my cold, dead hands). Even before and subsequently accounting for the weekend’s sushi and pizza, I was feeling particularly puffy and thirsty so I made a concentrated effort to drink. By 4P it was definitely alternating water refills with bathroom breaks. I’m not sure whether this mild dehydration was to blame or whether it was the heat, already being hungry on the way to the gym or something else, but it was one of those runs that just went nowhere. I pushed as far as I could doing 5.5/6.3 intervals, but at 1.8ish I side cramped and felt all the water sloshing. Enough was enough, so I walked a bit longer and then had a good stretch. I’m not worried about this being a sign of bad, just one of those days, and a reminder to watch the water. Tuesday: planned off day. 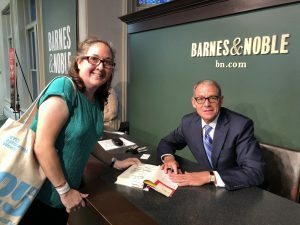 My favorite author’s new book came out and I went to the signing. More on that here. It was raining so hard and there was a funnel cloud (!) over the harbor, that step goal didn’t even happen. As it was Prime Day, I did treat myself to a Kindle Fire 8. A local run buddy speaks highlight of catching up on the DVR while on the treadmill, and since I can’t seem to go more than 10K on treadmill without a distraction and am half a season or more behind on the shows I “watch”, it might hit the spot. Any things I should be sure not to miss with it? Already have a Kindle and used to have an iPad, so this isn’t wholly new to me. Wednesday: knew it was going to be an active day as my office had its staff outing at Coney Island (screw the Mouse, Coney is forever my happiest place on earth!) It was a beautiful day to be at the beach for a visit to the aquarium and lunch on the roof at Kitchen 21. I got a little sunburnt/generally overheated and decided crosstraining better than running, so I got in a 5K row and good stretch. Thursday: office run group a casualty of summer schedules. It was a beautiful day and I wanted to run outside, but when I got to NYRR Run Center, there wasn’t a locker to be found. Instead I quickly headed home to change and was treated to this sun-kissed route for 3.5 miles. Foot & energy felt good, was glad to go end to sort of end, although there’s construction around Asphalt Green. 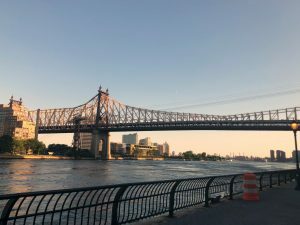 Rumor has it the ferry dock at E. 90th will be open at summer’s end which I hope means the walkway will be open up until at least the pedestrian bridge. Could I have gone longer? Probably, but playing it conservative with foot and no run longer than seven miles until the end of September. I’m going to come in below July’s mileage, but I’m OK with that. Friday: off day as I was out of town most of it, and with a long train ride finished It’s Just Four Times Round the Village, which was a fascinating look at the running career of a novice runner. Saturday/Sunday: up at mom’s this weekend and headed out to do 4-6 miles on this trail including the southern spur I found Easter weekend. The Esposito trail is wide and graded, the Hader Park segment is…not. In some places due to spring rains it’s barely even single track. I was just over two miles in, including a stint to go buy a bottle of water, when my toe met a rock. 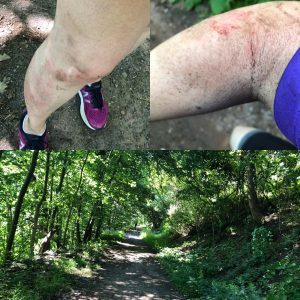 At first I thought I was going to catch myself, but my center of balance was off and I kissed the trail. Someone else quickly came over to see whether I was OK, and after taking in my arm and leg, I realized I was. And then I paused my watch. Nothing was broken, I was just mighty scraped up. I started to walk after pouring out my water bottle on the worst of the dirt but then realized I could run and so I did. I was texting mom to find out if she had bandaids and bacitraicin and she offered to come get me, but I was close to home and running was honestly fine. I had a shower and mom helped me clean up the worst of the road rash and I messaged Liz who I knew would appreciate the fall after her own a few weeks ago. She introduced me to a friend of hers named Greg who awarded me the wonderful badge above. My brother, sister-in-law and their two kids were down so we headed to the park. The day’s cross training consisted of walking there and scooting back as my brother carried my nephew’s scooter. I really think both activities contributed to my leg not being stiff and not particularly sore save for a few lightly bruised spots. My arm definitely bore the brunt of my fall making me doubly glad I didn’t break a bone. I’m glad I’m pretty sure I can run as rowing is definitely out this week as are kettlebells/planks. My right shoulder/upper arm is sore from the landing (just sore, not anything to worry about) and, as you can see above, my elbow is swollen due to the bruising/scrapes and a little tender. If I end up needing to go elliptical, I won’t use the arms. Thursday, NYRR R-U-N 5K. Was supposed to be the test of my speed work but between the foot and the fall, I may not push it. We’ll see. Will be a nice evening in the Park at the least. You are indeed officially a runner now – I’m glad it was reasonably OK and you got off fairly lightly, nothing broken and nothing embedded. Always good! And I’m glad I could get Greg to do a badge for you! Mind how you go as you will feel a bit jarred, heal well and take care of yourself. Funny re: embedded. Mom was pouring peroxide into the abrasion on my right knuckle (I have an excellent excuse to flip someone off as bending finger means it keeps spooging) and said “not sure if that’s dirt or a pebble. Luckily it was just dirt. Sweat, sunscreen, dirt and blood made for an interesting body paint. You are definitely a runner and a blogger! 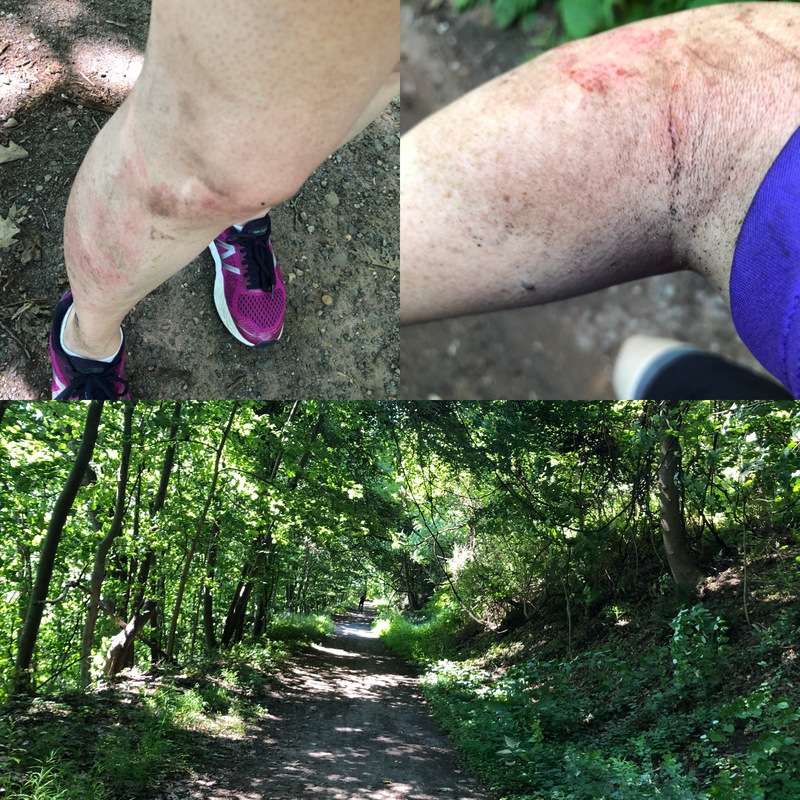 I started to walk back thinking it was going to hurt, but then I realized I’d be done more quickly if I just ran even if only to a place where the trail hit the road. I think/hope running kept me from stiffening up too much, although the bruise on my knee doesn’t feel great. Thank you! I’m of the opinion if you run, you’re a runner — even if you run walk, like me. I’m glad you’re ok! I’ve been lucky I’ve only fallen a few times. Two of them on the same run & I really went flying & was very scraped up — bit I ran back to the hotel. Didn’t have a whole lot of choice! Glad you’re OK after your falls. Yikes! Sorry about the fall. Glad it was nothing serious. You are most definitely a runner! i may need to check out that book! 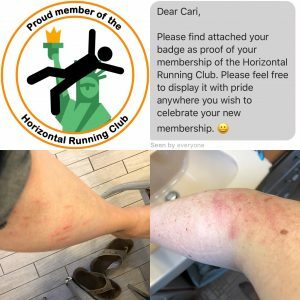 Horizontal running club is one that I wouldn’t want to join unfortunately I’ve been there several times even have fallen twice during races. OUCH!! That is why I avoid trail races but I do love running on trails but slowly. Yeah, I was already leaning no due to schedule but after the fall there’s no way I’m doing the race on this trail. It’s just too narrow to enjoy and I think falls will be all too common with recent water damage to it. I haven’t kissed dirt yet, and my next run in a trail/concrete/single track combo. I’m going to have to be careful. Good luck staying on your feet! For sure! as soon as Liz’s friend sent me the badge, I knew I had to have some fun with it. I’m glad you are okay after your fall. I’ve never been to Coney Island but am actually planning to go this summer. I am glad to hear it is your happy place and I am going now to check out Kitchen 21! We follow one another on Insta, right? 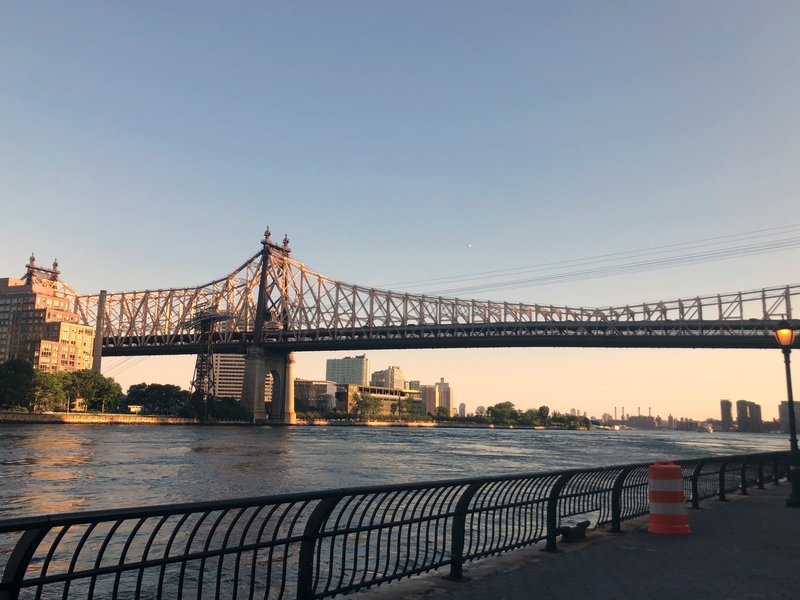 Feel free to message me if you have any Coney questions – I truly love it there.K21 is great, but there are a ton of restaurants on the boardwalk depending on your preferences, budget etc.